The secrets to making money–no matter what the market conditions! A fundamental guide to investing, Predict the Next Bull or Bear Market and Win shows you how to build your wealth and protect your investments in an ever-changing market. With author and financial expert Michael Sincere’s guidance, you’ll learn everything you need to know about the key economic indicators that can help you predict the market’s performance and better understand when to sell and when to buy. Unlike competing books that attempt a comprehensive survey of all market indicators, Sincere focuses only on those that make a real impact. His clear, concise strategies show you how to prosper during bull markets, be cautious during sideways markets, and make a profit when the market is going down. 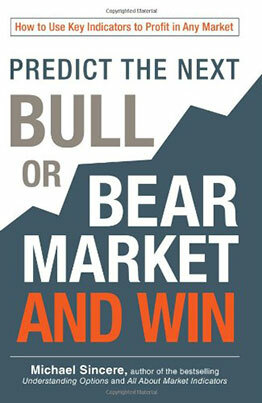 Predict the Next Bull or Bear Market and Win thoroughly educates you on the small number of indicators that are essential to a growing portfolio in a tumultuous market. By understanding the right economic indicators, you’ll learn how to make money in any kind of market!